The NWA Photo Negative Collection was assessed, organized and catalogued according to best practices of archives management. The Old Highland Neighborhood Association and Preserve Minneapolis held nine days of home restoration workshops led by nationally renowned tradesman Bob Yapp. These workshops focused on cost effective restoration methodology, including exterior wood repair, window restoration, and passive wood floor repair and restoration. The classes were free to participants, with all skill levels in attendance. National Register nominations in Winona! History Hound is spotted at the cool Washington County Historical Society ice cream social. A huge challenge for history organizations? Space! News from our Australian public history counterparts. Fighting potential floods in Washington, D.C.
Iowa Cultural Corridor Alliance, Coralville IA, seeks part-time Coordinator. Deadline: January 27, 2014. Cedar Rapids Museum of Art, Cedar Rapids IA, seeks Retail and Visitor Services Manager. Deadline: January 31, 2014. Fort Meigs Association, Perrysburg OH, seeks Site Director for Fort Meigs Historic Site. Deadline: February 3, 2014. Winona County Historical Society, Winona MN, seeks two Museum Inventory Specialists for grant-funded project positions. Deadline: February 5, 2014. Waterloo Center for the Arts, Waterloo IA, seeks Preparator/Technician. Deadline: February 7, 2014. Waterloo Center for the Arts, Waterloo IA, seeks Graphic Designer-Digital Arts Manager. Deadline: February 7, 2014. Champaign County Forest Preserve District, Mahomet IL, seeks Education Program Specialist, Museum/Education. Deadline: February 10, 2014. Hammer Museum, Haines AK, seeks Intern for a three-month paid internship. Deadline: March 15, 2014. Goodhue County Historical Society, Red Wing MN, seeks Executive Director. Position open until filled. Conner Prairie Interactive History Park, Fishers IN, seeks Historic Skills Interpreter. Primrose Farm, St. Charles IL, seeks Educator/Lead Interpreter. Blue Earth County Historical Society, Mankato MN, invites the public to attend a program by Heather Harren, Education and Outreach Manager, on "BECHS and Social Media," Thursday January 23, 2014, 6 p.m. Call 507-345-5566 for more information. Winona County Historical Society, Winona MN, announces the opening of "From Wapasha's Cap to Sugar Loaf: The Story of Winona's Landmark," January 25-June 15, 2014 at the history center. Opening reception January 28, 2014, 4-6 p.m. Call 507-454-2723 for more information. Goodhue County Historical Society, Red Wing MN, invites the public to author Fred Johnson's talk about the Sea Wing Disaster in 1890, Sunday January 26, 2014, 2 p.m. Call 651-388-6024 for more information. Shoreview Historical Society, Shoreview MN, hosts a talk about Kozlak's Korner, January 27, 2014, 7 p.m., Shoreview Community Center. Free. Steele County Historical Society, Owatonna MN, hosts Deb Lustig, who will speak on preserving your family treasures, Thursday January 30, 2014, 7 p.m. Call 507-451-1420 for more information. Dorothy Molter Museum, Ely MN, invites the public to their Annual Fundraising Dinner, Saturday February 1, 2014, 6 p.m., Grand Ely Lodge. Tickets: $25; call 218-365-4451 for reservations. Waseca County Historical Society, Waseca MN, announces their Annual Ice Harvest, Wednesday February 5, 2014, 9 a.m. to 3 p.m. The public is invited to watch the fun! Call 507-835-7700 for more information. Winona County Historical Society, Winona MN, presents a "Food for Thought" program by society archivist Walt Bennick about researching Sugar Loaf's past, February 5, 2014, 12:05 p.m. Call 507-454-2723 for more information. Dorothy Molter Museum, Ely MN, invites the public to their Winter Wilderness Whirlwind! program, Saturday February 8, 2014, 11 a.m. to 2 p.m. Free admission. Preservation Alliance of Minnesota, St. Paul MN, announces their first heart-bombing for preservation. Volunteer to make heart-bomb valentines the week of February 3, 2014; Valentines go up on select structures around Minnesota on February 10. Join the kick-off celebration, February 10, 2014, 6-8 p.m. Historical and Cultural Society of Clay County, Moorhead MN, presents "Doing Our Part: Clay County in WWII," their latest Clay County history exhibit at the Hjemkomst Center. Opening reception February 11, 2014, 4-7 p.m. Free. Call 218-299-5511 for more information. Friends of LeDuc of Historic Hastings, Hastings MN, will meet on February 11, 2014, 7 p.m. at the LeDuc Estate. Presentation on "Winter Sports on Swede Hill" follows a brief business meeting. Call 651-437-7055 for more information. The 48th Annual Meeting of the Oral History Association will be held in Madison WI, October 8-12, 2014. Call for Papers deadline: February 1, 2014. American Alliance of Museums is offering fellowships to its Annual Meeting for Alliance Professional and Student members who are underrepresented within the profession, emerging leaders, or mid-career professionals. Deadline: Monday February 10, 2014. University of California, Berkeley, announces the Native American Museum Studies Institute, a professional development opportunity for tribal museum professionals, June 2-6, 2014. Review of applications begins March 3, 2014. Northern Illinois University, DeKalb IL, announces a general archival knowledge workshop, "Archives: Principles & Practices," developed by the Society of American Archivists, June 9-10, 2014. Registration is limited to 35; early-bird deadline May 10, 2014. University of Wisconsin--Madison, School of Library & Information Studies announces their Spring 2014 Online Courses. PastPerfect announces their Spring 2014 classes. The Ordway, St. Paul MN, is soliciting nominations for the 2013 Sally Ordway Irvine Awards, available for any arts organization or individual in the state of Minnesota. Deadline: January 31, 2014. Contact Megan Mehl, 651-282-3101, for more information. National Parks Conservation Association announces a call for participants to their Future Leaders Council; individuals ages 18-34 are eligible. Deadline: January 31, 2014. 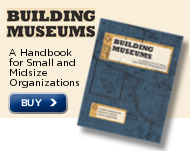 Museums Advocacy Day is February 24-25, 2014, in Washington, D.C. Registration deadline: January 24, 2014. The annual History Matters Day at the Capitol will be Monday March 10, 2014, 10 a.m. to 2 p.m. Please note that it will not be held on Presidents' Day this year, as the start of the 2014 Legislative Session will be on February 25. History Matters; please mark your calendars for March 10! International Quilt Study Center & Museum, Lincoln NE, announces the launch of their new website, World Quilts: The American Story. Cultural Data Project released "New Data Directions for the Cultural Landscape: Toward a Better-Informed, Stronger Sector," offering an assessment of the state of data collection and use in the arts and cultural sector. CDP invites you to join the conversation. Offer: Fax machine, free. Contact Ben Leonard for more information or to arrange pick up. View online information from the IRS on significant changes to Forms 990 and 990-EZ for 2013. Sign up for the Exempt Organization (EO) Update to receive free email updates from the IRS about issues that impact tax-exempt organizations. Fundraisers bring in revenue for organizations, raise awareness of their programs, and can pull in new members. Make your fundraisers community events to remember! Steele County Historical Society, Owatonna MN, hosts their third annual "Cabin Fever Reliever" fundraiser, Saturday January 25, 2014, 4-7 p.m. Entertainment includes crowning the King or Queen of Flannel. Call 507-451-1420 for more information or to purchase tickets. Scholarships are available to the 2014 AASLH Conference, St. Paul MN. Icy Pleasures: Minnesota Celebrates Winter, by Paul Clifford Larson. The Saint Paul Winter Carnival starts tomorrow, January 23, 2014!